(E,E)-geranyllinalool (GL) can be used as an intermediate for chemical synthesis of several drugs as well as an insect pheromone and spice. Traditionally, (E)-nerolidol was used as a substrate to make (E,E)- geranyllinalool but the yield was low due to the multiple and complicated chemical synthesis processes. In this study, the (E,E)-geranyllinalool synthase gene (AtGES, At1g61120) from Arabidopsis thaliana was inserted into the Escherichia coli vector pET30a(+). E. coli strains containing plasmids pIRS and pGG that enable the synthesis of (E,E)-geranyllinalool precursors, when co-transformed with AtGES, were able to synthesize (E,E)- geranyllinalool with a yield up to 31.42 mg/L. This is the first report about the production of (E,E)-geranyllinalool by manipulation of multiple genes of its biosynthesis pathway in E. coli. Our results may facilitate metabolic engineering towards more cost-effective production of (E,E)-geranyllinalool in microorganisms. (E,E)-Geranyllinaloolsynthase, E. coli expression, Metabolic engineering, GC-MS.
Geranyllinalool (GL) is a linear diterpene with special fragrance, and widely used in decorative cosmetics and detergents . In various plant species, including Arabidopsis thaliana, geranyllinalool is reported as a possible insect pheromone attracting herbivore predators . Geranyllinalool is also used pharmacy as an intermediate of several drugs such as teprenone. (E)-nerolidol is usually used as a precursor for chemical synthesis of (E,E)-geranyllinalool through eight steps of reactions, including protecting functional groups, oxidizing reaction, and halogenating reaction, etc. However, these complicated processes limit the yield of (E,E)-geranyllinalool synthesize chemically . There is a possibility to produce (E,E)-geranyllinalool through the metabolic engineering approach, using specially engineered microorganisms. Only a few (E,E)-geranyllinalool synthase (GES) genes including AtGES  in A. thaliana, MtTPS3  in Medicago truncatula, and PITPS2  in Phaseolus lunata have been cloned and characterized. In plants, (E,E)-geranyllinalool is formed from (E,E,E)-geranylgeranyl diphosphate (GGPP) by GES, while geranylgeranyl diphosphate synthase (GGPPS) catalyzes isopentenyl diphosphate (IPP) and dimethylallyl diphosphate (DMAPP) precursors to form GGPP . IPP and DMAPP can be interconverted by isopentenyl diphosphate isomerase (IDI) to balance their usage in the production of long chain isoprenoid precursors . The methyl erythritol phosphate (MEP) pathway in prokaryotic bacteria and plant plastid can lead to IPP , the yield of which is controlled by two rate-limiting enzymes, 1-deoxy-D-xylulose-5- phosphatesynthase (DXS) and 1-deoxy-D-xylulose-5-phosphate reductase (DXR) . The truncated E.coli gene idi, dxr and dxs were inserted into pCDFDuet vector to construct the recombinant plasmid pIRS and successfully improved the yield of IPP and DMAPP . Furthermore, GGPPS also was expressed in E.coli to provide the GGPP precursor for diterpene production in metabolic engineering, in which one plasmid, pGG, containing the truncated Abies grandis GGPPS gene, was successfully constructed . In this study, the AtGES was cloned and inserted into pET30A(+) (pET30a-AtGES) and co-transformed into E. coli with pIRS and pGG to obtain a bacterial strain for (E,E)-geranyllinalool production. Remarkably, (E,E)-geranyllinalool yield in E. coli strain C41 (DE3) strain harboring pIRS, pGG and pET30a-AtGES was about 8 times higher than that of E. coli strain BL21 (DE3), reaching 31.42 mg in 1L TB culture medium. To our knowledge, this is the first report about the production of (E,E)-geranyllinalool by manipulation of multiple genes of its biosynthesis pathway in E. coli. Materials and reagents: The Columbia (Col-0) ecotype of Arabidopsis thaliana was obtained from State Key Laboratory of Tree Genetics and Breeding in Chinese Academy of Forestry. They were grown in soil in a growth chamber at 18°C for 6 weeks under long-day condition (16-h-light/8-h-dark photoperiod). The A. thaliana was treated by 100 μM methyl jasmonate (MeJA) for 12 h. The leaves were harvested from the treated seedling and were immediately frozen in liquid nitrogen for the RNA extraction and subsequent analysis. The plasmids pIRS and pGG were obtained from Professor Reuben J. Peters (Iowa State University). Constructing prokaryotic expression vector of AtGES: Total RNA was extracted from the A. thaliana leaves using RN38- EASYspin Plus (Aidlab, Beijing). First-strand cDNA synthesis was carried out with 3μg total RNA using the PrimeScript™ II 1st Strand cDNA Synthesis Kit (Takara, Dalian). Nde I and Xho I restriction sites were used for cloning into the vector pET30a (+) (Taihe, Beijing). According the specification of Seamless Assemble Cloning Kit (Taihe, Beijing), the homologous ends (underlined sequences), were constructed. With the ORF of AtGES (TPS04; At1g61120), the upstream primer AtGES-F (TTTAAGAAGGAGATATACATATGGCCACTCTCCTGCAAATAGGT) and the downstream primer AtGES-R without the terminator codon (CAGTGGTGGTGGTGGTGGTGCTCGAGATCTAAAGGAATCGGATTGA) were designed using Primer5 Software. AtGES gene was cloned using Primer STAR Max Premix (Takara, Dalian), and inserted into pET30a(+) to produce pET30a-AtGES constructs using Seamless Assemble Cloning Kit (Taihe, Beijing). Constructing and expressing the (E,E)-geranyllinalool fermentation engineering strain: All three plasmids containing 0.5 μg plasmid DNA, pIRS, pGG and pET30a-AtGES (or pET30a(+)), were co-transformed into E. coli BL21 (DE3) (CWBIO, Beijing) and E. coli C41 (DE3) from Professor Qiang Wang (Sichuan Agricultural University). The resulting recombinant strains were grown under selective conditions using the antibiotics, chloramphenicol, spectinomycin, and kanamycin at concentrations of 34 μg/ mL, 50 μg/mL, and 50 μg/mL respectively. Expression was initiated from a clone confirmed by sequencing and the clone was inoculated into 60 mL liquid TB media according to the method reported by Morrone et al . For both the shake flasks cultures, initial growth to log phase was carried out at 37°C (OD600~0.6). Then the culture was transferred to 18°C shaker, and 6 mL phosphate buffer and 660 μL 50% glycerol were added. Shaking was held at 200 rpm, and the cultures was induced by addition of 0.2 mM isopropy-β-D-thiogalactoside (IPTG) with continue growth for 48 h .
10 mL culture was centrifuged at 8000 rpm/min for 8 min, and got the bacterium precipitate, which was resuspended with 2 mL Bacterial Protein Extraction Kit (CWBIO, Beijing), and centrifuged after being incubated at 37°C for 3 h. The supernatant was collected for SDS-PAGE to analyze AtGES recombinant expression. GC-MS analysis and quantification of products: The remaining 50 mL culture was extracted using 50 mL hexane (Fisher) for 8 h, and then extracted further with ultrasonic for 10 min. The hexane extract was concentrated to 1mL by a gentle flow of nitrogen gas prior to GC-MS. For GC-MS analyses, all samples were analyzed on an Agilent 7890A gas chromatograph equipped with a Agilent 5975C mass selective detector and a HP-5MS capillary column (30M × 250 μm ID × 0.25 μm film thickness). 1 μL sample was injected with splitless mode, and was carried by helium gas with 1 mL/min flow rate. The samples were analyzed with the following temperature program: 80°C for 2 min, followed by a 10°C/min ramp to 210°C, and then 3°C/min ramp to 240°C. Injector and MS quadrupole detector temperatures were 250°C and 150°C, respectively. The standard curve was made using the (E,E)-geranyllinalool standard with the different concentrations, 100 μg/mL, 50 μg/mL, 25 μg/mL, 12.5 μg/mL, and 6.25 μg/mL. (E,E)-geranyllinalool standard was purchased from Sigma (Beijing, China). Constructing prokaryotic expression vector of AtGES: The ORF of AtGES gene was 2634 bp (Figure 1), which was amplified and inserted into pET30a(+) vector through restriction digestion using Nde I and Xho I. The recombinant construct was transformed into DH5α to get the recombinant plasmid pET30a-AtGES and confirmed by sequencing. 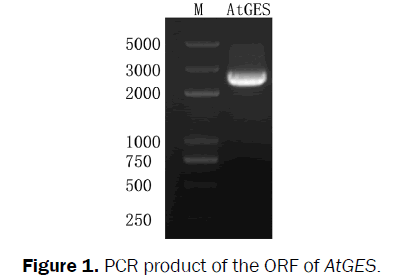 Figure 1: PCR product of the ORF of AtGES. Analysis of fused protein: AtGES was expressed in E.coli through transformation of pET30a-AtGES into E. coli BL21 (DE3) and E. coli C41 (DE3), and the empty vector of pET30a(+) was used as negative control. SDS-PAGE analysis showed that AtGES successfully expressed in E. coli as recombinant protein with about 104 kD molecular weight (MW), which is in accord with predicted MW (Figure 2). Figure 2: PAGE analysis of the AtGES recombinant protein. The black arrows highlights the recombinant protein of AtGES. GC-MS Analysis: To characterize the (E,E)-geranyllinalool production, pET30a-AtGES, pIRS and pGG were co-transformed into E. coli. The organic extract of engineering strain culture was analyzed by GC-MS, which showed that AtGES reacted with GGPP to make (E,E)-geranyllinalool through comparison with retention time and mass spectra of the authentic standard. As indicated in Figure 3, there was no (E,E)-geranyllinalool production in the control strain that was not transformed with AtGES, and clear (E,E)- geranyllinalool peak was detected in AtGES expression culture with same retention time (17.623 min.) and mass spectra as that of authentic (E,E)-geranyllinalool (Figure 4). 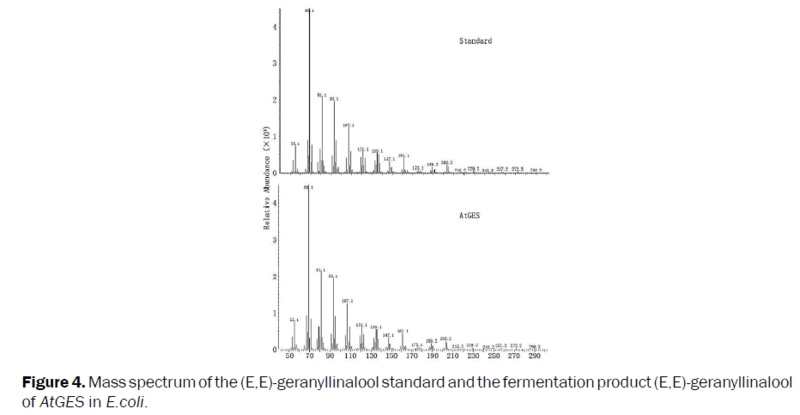 Figure 3: GC-MS analysis of the control, the fermentation product of AtGES in E.coli and the (E,E)-geranyllinalool standard. Figure 4: Mass spectrum of the (E,E)-geranyllinalool standard and the fermentation product (E,E)-geranyllinalool of AtGES in E.coli. The quantification of (E,E)-geranyllinalool produced through metabolic engineering approach: To carry out the quantitative analysis of (E,E)-geranyllinalool production, the external standard curve was made through injection of a series of (E,E)- geranyllinalool standard with different concentration. The equation of standard curve was Y=8.636*X+5.804, and the R2 was 0.997, suggesting good reliability for quantification. Using this standand curve and equation, the yield of (E,E)-geranyllinalool in E. coli BL21 (DE3) engineering was measured to be 3.74 mg/L. Further yield improvement was performed using E. coli C41 (DE3) strain, which was reported to have higher protein expression level . Remarkably, about 8 fold yield increase was detected in the C41 engineering strain with a yield of 31.42 mg/L of (E,E)-geranyllinalool obtained. (E,E)-geranyllinalool is a pharmaceutic intermediate, insect pheromone and a spice, and usually synthesized from (E)- nerolidol through complicated chemical reactions, which limit the yield. Metabolic engineering approach was widely used to synthesize various compounds, but requires significant characterization of the biosynthetic genes required to synthesize the required product. AtGES was characterized to catalyze (E,E)-geranyllinalool formation from GGPP and could be utilized through metabolic engineering approach to make (E,E)-geranyllinalool. In this study, we made the recombinant expression construct of AtGES and successfully expressed it in E. coli strain. Coexpression pET30a-ATGES with pIRS and pGG harboring upstream gene to provide precursor of (E,E)-geranyllinalool resulted in a good yield of (E,E)-geranyllinalool in the E. coli BL21 engineering strain (3.74 mg/L). Optimization using E. coli C41 strain, increased the yield to 31.42 mg/L, which indicated the potential for further improvement of yield, such as incorporation of mevalonate (MVA) pathway and precursor feeding. With further optimization, our expression system may provide sufficient yields for commercial synthesis of (E,E)-geranyllinalool in a bioreactor in the near future. This work was supported by the Basic Research Fund of RIF (RIF2014-01). Chen W and Viljoen AM. Geraniol- a review of a commercially important fragrance material. S Afr J Bot. 2010; 76: 643-651. Lemaire M, et al. Geranyllinalool (Diterpene Alcohol). J Chem Ecol. 1990; 16: 2067-2079. Zeng QL. The chemical synthesis method of (E,E)-geranyllinalool. 2007; China Patent 101070270A. Herde M, et al. Identification and regulation of TPS04/GES, an Arabidopsis geranyllinalool synthase catalyzing the first step in the formation of the insect-induced volatile C16-homoterpene TMTT. Plant Cell. 2008; 20: 1152-1168. Arimura GI, et al. Herbivore-induced terpenoid emission in Medicagotruncatula: concerted action of jasmonate, ethylene and calcium signaling. Planta. 2008; 227: 453-464. Brillada C, et al. Metabolic engineering of the C16 homoterpene TMTT in Lotus japonicus through overexpression of (E, E)-geranyllinalool synthase attracts generalist and specialist predators in different manners. New Phytol. 2013; 200: 1200-1211. McGarvey D J and Croteau R.Terpenoid metabolism. Plant Cell. 1995; 7: 1015. Thulasiram HV.A common mechanism for branching, cyclopropanation, and cyclobutanation reactions in the isoprenoid biosynthetic pathway. J Am Chem Soc. 2008; 130: 1966-1971. Rohmer M. From molecular fossils of bacterial hopanoids to the formation of isoprene units: discovery and elucidation of the methylerythritol phosphate pathway. Lipids. 2008; 43: 1095-1107. Lichtenthaler HK. The 1-deoxy-D-xylulose-5-phosphate pathway of isoprenoid biosynthesis in plants. Annu Rev Plant Biol. 1999; 50: 47-65. Morrone D, et al.Increasingditerpene yield with a modular metabolic engineering system in E. coli: comparison of MEV and MEP isoprenoid precursor pathway engineering. Appl Microbial Biot2010; 85: 1893-1906. Cyr A, et al. A modular approach for facile biosynthesis of labdane-related diterpenes. J Am Chem Soc. 2007; 129: 6684-6685. Cheng D, et al. High-level expression of recombinant rabbit cytochrome P450 2E1 in Escherichia coli C41 and its purification. Protein ExpresPurif. 2004; 33: 66-71.